Created in 1968, this work epitomizes the simple, daring and lively colour forms that defined Sonia Delaunay’s energetic late period of abstraction. A pioneer of the radical movement of Orphism with her husband Robert, Delaunay is celebrated as a key member of the Parisian avant-garde that liberated colour from subject across painting, fashion and design. This new poetic language of colour and form, also referred to as ‘Simultaneous Contrast’, created an emotional vitality by combining primary and secondary tones, inspired by the scientific theories of Michel-Eugène Chevreul. Born into a Jewish family in Ukraine in 1885, Delaunay studied in St Petersburg before travelling to Germany and Paris. Surrounded by the stimulus of contemporary German Expressionists, Fauves and Post-Impressionists including Gauguin and Van Gogh, Delaunay was driven to experiment with colour which she described as “the skin of the world”. Delaunay developed this fascination with colour and design through a number of creative outlets, but increasingly turned to painting following the death of her husband in 1941. ‘Rythme couleur’ is characteristic of these later paintings made in the 1960s which adopted a greater formal freedom in Delaunay’s rhythmic patchwork of abstract, bright forms, many of which became the inspiration for mosaics, textiles and tapestries. 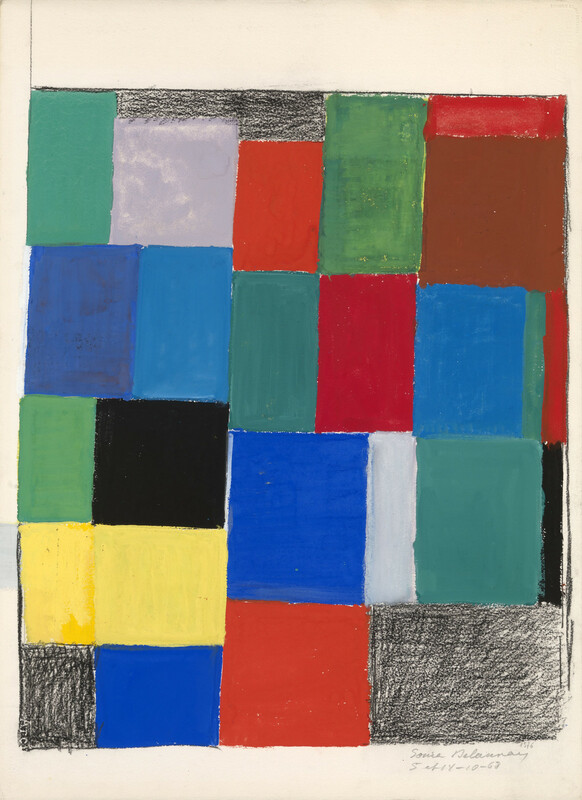 This image particularly resonates with the important series of 11 gouaches that Delaunay made two years earlier in 1966 to accompany the publication of ‘Rythmes-Couleurs’: published by Jacques Damases, this book extoled the inner power of art through the juxtaposition of contrasting colour. During the 1960s and 70s, Sonia Delaunay began to receive international recognition as she became the first living female artist to exhibit at the Louvre (1964), 114 works by herself and her husband were donated to the Musée National d’Art Moderne, Paris and she was awarded the French Legion of Honour (1975). Since her death in 1979, Sonia Delaunay has been the subject of major retrospectives around the world including most notably the recent exhibition at Musée d’Art Moderne de la Ville de Paris and Tate Modern in 2015, which was the first of its kind in the UK. This work is registered under number F 1576 in the Fundacion Arcontit archives and is accompanied by a certificate of authenticity issued by Jean Louis Delaunay and Richard Riss, dated 29 September 2016.